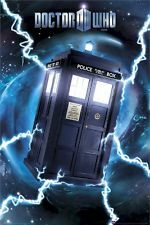 In Doctor Who’s “The Woman Who Lived” we discover what has become of Ashidr, “The Girl Who Died.” It’s 1651, 800 years after the Doctor saved her life, giving her immortality. As the centuries have passed she doesn’t remember her original name and her home village, but she has never forgotten the Doctor. Ashidr is not the same Viking girl that Doctor resuscitated with the Mire med kit. The years of constant loss have taken their toll. She has gone from helping people to robbing, killing, and taking whatever she wants. Centuries spent seeing lives flicker and burn has left her feeling human lives have little value. Despite all her years of loss and loneliness she has has never used the other Mire med kit the Doctor left for her, so she remains alone. In 17th-century England, the Doctor comes upon a robbery in the forest. He is pursuing an alien object that has ended up on Earth. He tracks it to a trunk in a carriage. Unfortunately the carriage is being robbed by a brigand known as the Knightmare. As they argue over whose robbery it is, the carriage drives away. As he returns with Ashidr to her country manor, something watches from the edge of Ashidr’s estate. The Doctor has been following an object radiating exoplanetary energy across the galaxy. Ashidr thinks they may be looking for the same object. Once inside, the Doctor can see she has no need for money. She tells him that she steals for the adventure. He wonders how she knows he has a ship. Ashidr wants the Doctor to take her with him, but he puts her off. She tells him she’ll help him find the thing he’s looking for by breaking into the home of the woman they tried to rob earlier, Lucie Fanshawe. Lucie has been boasting about her ancient amulet from foreign lands. Ashidr tells him they’ll leave in an hour. He spends that time in the library filled with Ashidr’s journals. Her journals take up much more space than his 2,000-year-old diary. The Doctor reads about Ashidr losing her lover to age, her neighbors to the plague, and her children to death. When the Doctor reads her journals does his think about his own lost descendants? Meanwhile, Ashidr goes outside and speaks to a creature with a lion face and red eyes in the bushes. She tells the creature that her visitor will help her to get the artifact. She has her own plan for the object the Doctor is seeking. When they come back together the Doctor asks Ashidr why she’s torn out pages from her journals. She tells him she does it when things get really bad. She keeps the pages about her dead children though, to remind her to never have any more babies. He tells her, “I’ve left you alone too long. I had no idea how much you’d suffered, but I remember the person you used to be. She’s still in there. I can help you find her.” Ashidr doesn’t think she needs any help from the man who runs away. She wants him to wear a mask, but instead he takes out his sonic sunglasses. Boo! Hiss! 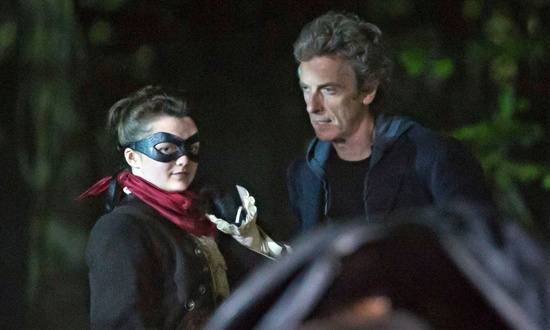 We hoped we had seen the last of those in “The Girl Who Died.” He would look so much cooler if he wore a mask like hers. As they break into Lucie’s house, the Doctor makes small talk, asking her what happened to the second med kit he left for her to make another immortal to join her. She still has it, but she’s never thought anyone was good enough. You would’ve thought she would have used it on one of her children, but perhaps she didn’t since they died in infancy or because she realizes that immortality is a curse of sorts. They find the artifact—a jewel-looking object the Doctor calls the Eyes of Hades. As they return through the forest, they are apprehended by a group a brigands led by the very dramatic Sam Swift. Ashidr tries to frighten him by telling him she’s the Knightmare. Sam and Ashidr throw insults back and forth. Sam asks if the Doctor is her dad. The Doctor is not amused and takes a firm stand against puns and banter, “I’m on record on the subject of banter.” Ashidr and the Doctor quickly take control of the situation. The Doctor wants it on the record that he is not her dad. Ashidr wants to kill Sam Swift, but the Doctor warns that he will become her enemy if she kills Sam. The Doctor may not be her dad, but he is responsible for creating who she has become in some ways. The creature with the lion face and the red eyes arrives. He is Leandro from Delta Leonic. He claims that his world was destroyed and his wife was killed when they escaped. He crashed to Earth, landing on Ashlidr’s grounds. Leandro claims he lost the amulet when he crashed and he needs to open a portal to leave. Leandro tells the Doctor that a death is required to make it work. Ahhh, there’s the rub. She is ready to kill her old servant, who clearly has an affection for her. 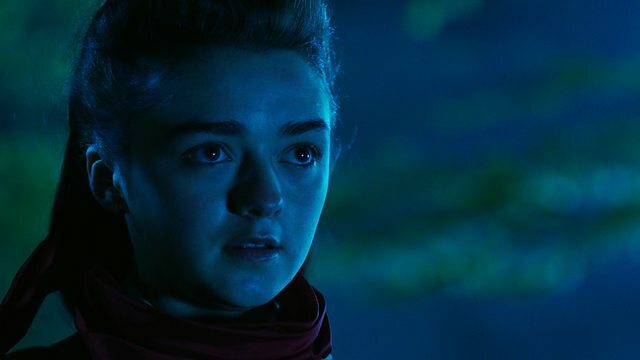 Ashlidr complains that he left her to trudge through immortality on her own, asking, “Do you ever think or care what happens after you’ve flown away?” Ashildr has found someone she believes can free her from the trap the Doctor left her in. The Doctor tries to warn her that Leandro is likely to be bad news, but he’s still not offering to take her with him, to be responsible for her. Pikemen from the town arrive to warn her that the Knightmare was headed towards her house. Sam Swift has been captured and is to be hanged at noon. She tells them the Doctor was a thief she apprehended. She departs with the intention to use Sam Swift as the sacrifice she needs for the portal to open. After she leaves the Doctor is able to bribe the men with Ashlidr’s riches and follows her. Ashlidr and Leandro mill about the village square as Sam Swift tries to entertain the crowd in order to delay his execution. He asks Ashlidr for a last kiss and she obliges. Surprisingly, no one notices the big man with the lion face. People see what they want to see. Sam sees the Doctor in the crowd and they start to do a comedy routine. The Doctor makes his way to the stage and shows the executioner his psychic paper, showing that Cromwell has pardoned Sam Swift. The crowd wants to see an execution and starts calling for the Doctor to be hanged. Before that can happen, Ashlidr plants the Eyes of Hades right into Sam’s chest, killing him, and opening a portal in the sky. When the portal opens the crowd finally starts to notice something is wrong and they even realize there’s a “lion-man” standing before them. Once it becomes clear that Leandro means to incur an invasion, Ashlidr suddenly becomes protective of the defenseless people of Earth. Ashlidr is surprised to find that she actually cares. The Doctor tells her, “It’s awful, isn’t it? It’s infuriating. You think you don’t care and then you fall off the wagon.” When she asks the Doctor how she can help the people in the square being targeted with lasers, the Doctor suggests, “Sam Swift, he’s the conduit. The amulet, it’s still in him. It’s his death that’s opening the rift. So what do we do?” To reverse his death, she takes out second Mire med kit he left for her and puts it on Sam’s forehead. Once it is absorbed, he awakens. He’s pretty happy about being alive. She asks the Doctor if Sam will be immortal now, but the Doctor thinks reversing the portal will have drained much of its power. But he really doesn’t know, and Sam Swift could be around for some time. “The Woman Who Lived” provided compelling resolution for Ashlidr’ story, while also leaving a little intrigue around her character. It was is a good story that connects well to the Season 9 theme of loss. The Woman Who Lived” continues the tradition of smart stories that keep us engaged, without all the distracting bells and whistles we’ve seen in past series. Season 9 of Doctor Who continues to be an outstanding series.